The initial sketches for the upcoming wedding clothes. I will also be making a cape for Michael of the shorter French variety. Their fabrics are really lovely. The main fabric is an Ivory and taupe brocade. 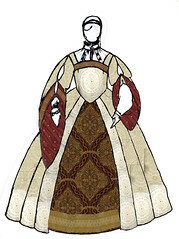 This will be her bodice, overskirt, and sleeves and his doublet. The forepart is a spectacular burgundy and gold chenille brocade. There is also two red taffetas with embroidery. We are still working on Acquiring all the trim and the remainder of the support fabrics, but Dianna and are in the process of beading. 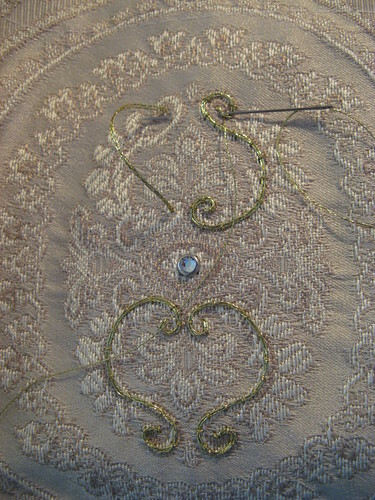 I am doing the initial rhinestone setting and the couching of the curls in gold cord on the ivory brocade. There are more pictures of that here in the O’Connor Wedding album on Flickr. ...and beautifully I might add. This is a picture of Michael's beadwork that his lovely wife did for him. Dianna slaved awat at all the fill beadwork for this outfit, which was sustantial since that was the only real trim for all the ivory brocade. ﻿This is Dianna's skirt hem. Because I used the design woven into the fabric for the trimming pattern, I had to level the skirt from the top. 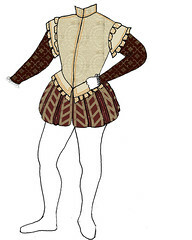 This is typical in early Victorian hoop tailoring, but I am not sure about Elizabethan. It worked at that was what was important. The skirt was heavily beaded at the hem and up the front, and the body was beaded with sequins and pearls. The gold lace trim at the bottom of the forepart is mounted over the ivory satin that I used in much of Michael's doublet. It was then trimmed with garnet colored glass beads and pearls. Here is the sleeve and bodice coming together. We matched the center of the bodice to the beading around the skirt hem, and I filled in the couching and fill beads. The sleeve is somewhat of a modified Tudor/Italian sleeve, but it matched our portrait, and also looked lovely over the partlet I made her with trim and beads going down the sleeves. There are 3 sets of buttons on each sleeve and they can be cuffed up higher if desired. So here is the problem with Michael's part of this Journal; I did not take any in-process pictures. I haven't found any anyway. If I do, they will certainly go up. You cn see in the pictures of Michael, that I used this portrait as a reference for the trimming that I did with lots and lots of 1/8th inch gold twisted cord. It is around the edge of all the little picadils, and appliqued down in the chevron pattern seen in the portrait. I used a similar pattern as slops for Michael's panes, but there were fewer of them , and he likes his slops longer. There was also meant to be a cape, but I could just not get it done befire the wedding. He got it soon after though. The ruff was done by Tammy Dupuis with Renaissance Tailor. Michael's hat was made by our friend Pam Palmer at La Paloma Hats, and the embroidered shirt was made by our friends Tony and Pam Camera. They accept commissions, please ask if you are interested. I will see if I can't locate some more pictures and as I do I will add them in, but this project is...off the cutting table.